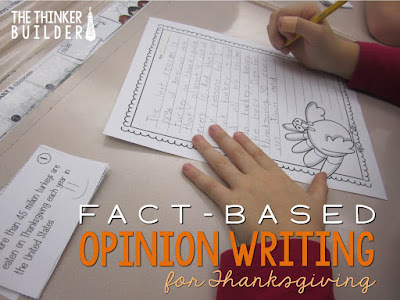 I wrote a post over on the Who's Who blog about a lesson on opinion writing that I did with my class last year during the week of Thanksgiving. It focuses on the question: Should turkey be Thanksgiving's main dish? We analyze turkey facts and discuss how they might support our opinion before we dig into writing. There's a little freebie included, so head on over if you are interested in reading more. Just click HERE.